The Python Ireland community has been around since 2005 and in recently years has been growing rapidly. We could say this is due to the general increase in python development in tech but really we know it's because the community is awesome, people just want to come hang out with others like them, and learn more Python on the side. We run monthly Meetups in Dublin. These consist of a talk or talks followed by a trip to the nearest pub for a bit of banter. For more information on the Dublin Meetups just sign up to our meetup group. If you are interested in running your own Meetup outside of Dublin please get in touch. We want to help facilitate the growth of the community across Ireland. For help organising any Python related events send us an email to [email protected]. 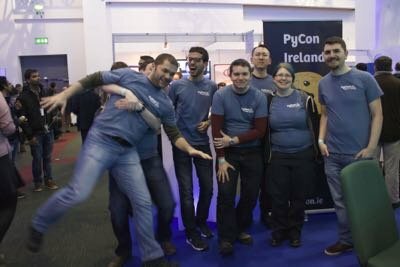 Python Ireland also organises Pycon Ireland. This is two day conference packed with talks and tutorials followed by two days for sprints. This conference has being growing steadily throughout the recent years with over 350 people in attendance of 2017's event.